Superior noise blocking earplugs made from soft, skin friendly foam. Protects your ear for up to 32 decibels. Easy to roll and insert into your ear. 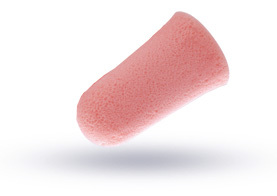 Foam gently expands inside your ear making a perfect, secure and comfortable fit. Re-usable, skin coloured, discreet and extremely soft to use. Ideal for work, sleep, and relaxation. Ohropax Soft can be easily cleaned and re-used. Ohropax Soft are our best selling earplugs, anatomically shaped and made from soft, skin-coloured foam that gently expands to fit your ear canals perfectly. Helping millions of people to protect their ears from noise, Ohropax Soft are re-usable earplugs perfect for work and home. Ohropax Soft earplugs effectively insulates noise across the entire frequency range. Superior, reusable earplugs suitable for use at home for your DIY projects, undisturbed sleep and relaxation. They are also useful for work environments and exposure to loud music. Ohropax Soft protects your ears for up to 32dB. Ideal for sleeping, reading, work, loud music, DIY activities and simply relaxing. Product information "Ohropax Soft Earplugs"
Packaging: The Soft earplugs come in a handy transparent plastic case with 10 earplugs (5 pairs) inside. Related links to "Ohropax Soft Earplugs"
Customer Review for "Ohropax Soft Earplugs"
Best earplugs for comfort that I have found. Good noise reduction with them too. All the best and I will definitely buy products from you. I bought these plugs as a supplement to a set of custome mounded plugs I had made for when I ride my motorcycle. However, I now ONLY use these ear plugs as they are without doubt the best I've ever tried. Very highly recommended. I bought a box 5 years ago and had to buy the exact brand because they are honestly the best ear plugs I have ever used. I use them on the plane, when in a firing range and also robbed and they work amazingly. They don't tune out wailing babies though. Used it for a couple of weeks or so and it's very good. For reference I have moderately large ears as I'm 195cm (6' 5"). It blocks a lot of sound, but in case someone was wondering if these can be truly soundproof, no you'll still hear sudden, loud sounds (which is good). Very comfortable to sleep with. I was recently at a hotel in Bulgaria a few yards from a beach bar that liked to keep its elephant-sized subwoofers pushing as hard as they could until 6am. Step forward the magic Ohropax, seconds after putting them in the thudding magically vanished and sleep became possible. Invaluable. Needed these for a concert - well built & do the job! These are lovely and soft and I give full marks because my partner wears them. However they're too big for me and I wear the slim ones by Macks. Best ear plugs I have ever used. Second box I'm buying - really comfy earplugs with good attenuation. I can't sleep without them! I am a very light sleeper, and normal ear plugs do nothing for me. I bought these last year and have continued to buy them as they block out most, if not all, noise. Without these, I wouldn't be able to sleep. They're soft and very comfortable. Would highly recommend! Very good product. I really like Ohropax as they are very soft, and are easy to squash to get into my small ear canal, which some brands are not. They are also very effective at keeping out noise. I would thoroughly recommend. Amazing! These ear plus are incredibly comfortable. I hate using them normally, but these are great. They fit nicely and are so soft in your ears. They completely block out all noises which is amazing! I don't hear out neighbours loud music or my husband's alarm clock. Totally worth the money. I have been enduring my wife's snoring for many a year and decided to do something about it. Ohropax ear plugs do the trick!!! I now have many a nights wonderful sleep without any external intrusion, and I am still on the very first pair of ear plugs, with 4 pairs still to go. Used for a long distance flight and worked perfectly. Was far better than the ones supplied by the airline and helped me with sleeping, of which I usually had difficulty with.